Coach Joe Desmarais let off a shrill blast from his whistle, and the teams were off — member of one floor hockey team spearing a broom handle through a hole in the center of a felt-padded disc, while two members of the opposing team careened across the gymnasium floor at White Brook Middle School in Easthampton, guiding the puck toward the goal where 29-year-old Anna Oliver was waiting on defense — her own stick was planted firmly on the floor in front of her, a determined look splashed across her face. Oliver’s first opponent passed to her second, who took a shot on goal, but the goalie successfully knocked it away. The two began to grapple for the puck, looks of determination shifting to broad smiles when Moyston was able to turn it over and shoot for the goal again. 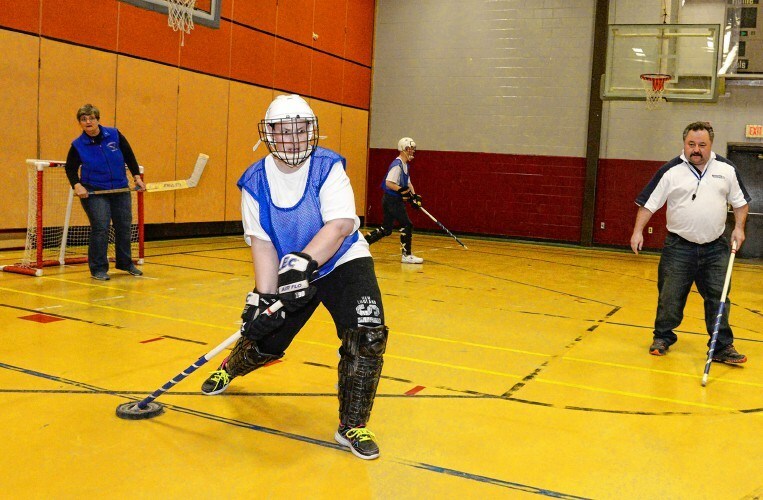 The match was part of a practice for the Hampshire Eagles, the Special Olympics floor hockey team Oliver plays for. Moyston, 42, isn’t actually her roommate, at least not in the traditional sense. Oliver is mildly developmentally disabled and lives with Moyston and her two sons, Isaiah and Devine, through ServiceNet’s shared living program. 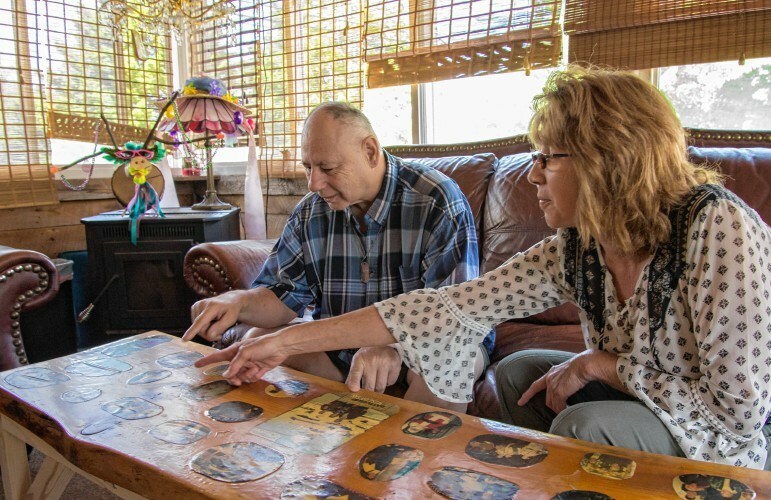 The program, according to Amy Swisher, the organization’s vice president of advancement, connects higher-functioning disabled people with families willing to take them in and provide basic care. 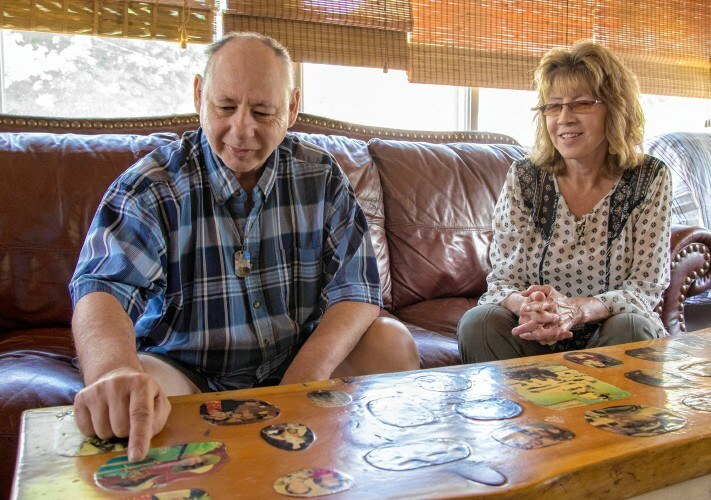 It’s one of the ways the organization helps developmentally disabled people live with more of a sense of independence than they would have in a halfway house or group home, Swisher said, while still allowing them to have people around for support, if they need it. Jessica Whitney, the program’s operations director, said she thinks the roommate analogy is an apt metaphor. “It’s really a roommate with some support,” she said. Oliver is one of 10 people living in such an arrangement in Franklin and Hampshire County, Swisher said. All together, the program serves 35 clients in ServiceNet’s region. Previously, she lived in a group home, but had a hard time getting along with some of the other residents, she said. She’s also lived on her own in Easthampton before, but found it tough to keep appointments and cook, among other tasks. “The residential was a little bit too much support, and the independent was not enough — and then you have shared living, that in-between,” Whitney said. 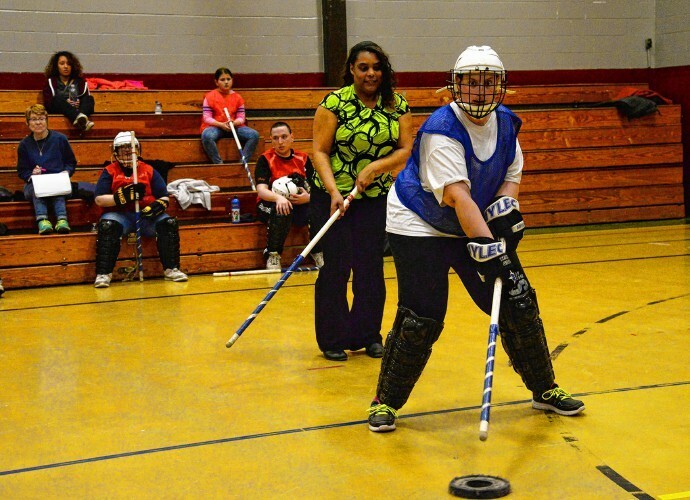 Whitney said Oliver was a perfect match for the Moystons — she’s involved not only with the Eagles’ floor hockey team, but also with the group’s flag football and volleyball teams. That sports-heavy lifestyle meshed particularly well with the Moyston’s, since both of her sons are involved with the Amherst-Pelham Regional School system’s football team. During games, Oliver and Moyston could be found operating the concessions stand, while Isaiah has given some of his time to the Eagles as a unified volunteer, playing alongside the players during flag football tournaments in Boston and helping organize practices. 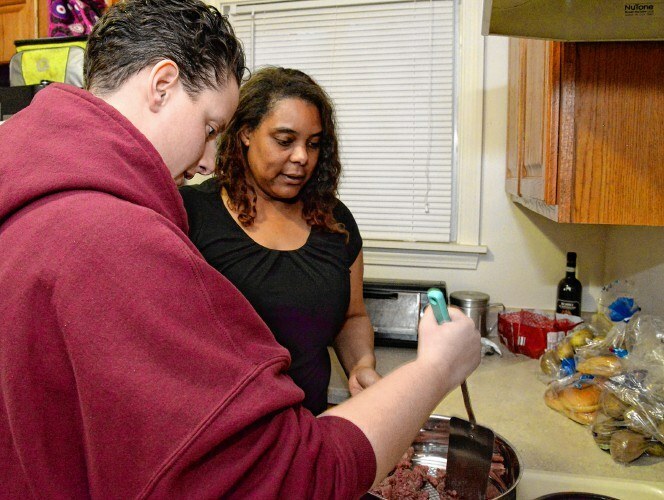 When she isn’t playing sports, Oliver might go to work as a dish washer at the nearby University of Massachusetts Worcester dining hall or take the bus into Northampton, where she participates in support groups at ServiceNet’s clinic. Those groups help her learn to socialize or express her feelings. When she gets home, she might help Moyston prepare nachos, loaded with ground beef and cheese, for dinner before the two go off to a meeting of the Amherst Human Rights Commission, on which Moyston, an administrative assistant in the town manager’s office, sits as a staff co-liaison. Moyston said she came into contact with the Shared Living program while working in the human services industry, where she’s spent most of her career. Her position in the Town Manager’s office is her first outside that field, and participating in the program was a way for her to continue to support that work even if she wasn’t working in it directly. Plus, her household is down to herself and two boys, she said. She welcomes another girl in the house to balance things out. While Oliver is quite high-functioning, despite her disability, the Shared Living program serves clients from across the spectrum of developmental disabilities, Swisher said. In Erving, Michael Labonte and Geraldine Cornwell do just about everything together, from attending events at the local senior center or Moose Lodge to tackling carpentry projects at Cornwell’s boyfriend’s house in Orange. The pair have lived together through the shared living program for 13 years. At 62, Labonte is older than Oliver and has higher needs, but the scene between he and Cornwell is quite similar to the one between Oliver and Moyston. Cornwell, too, first encountered Labonte while working for ServiceNet. He was living in a group home, and Cornwell said he seemed lonely and unhappy. So, she offered to bring him as a guest to her family’s Christmas party one year. He was a hit, so she kept bringing him to family gatherings or functions. In 2003, he moved in with her. Labonte’s ability to join Cornwell in her day-to-day activities, and when she goes out to community events, is at the core of what shared living is designed to promote among its clients, Whitney said — inclusion.